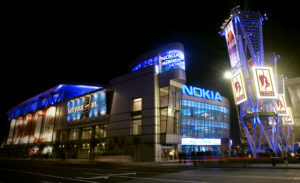 The Nokia (now Microsoft) Theater is centrally located within L.A. LIVE, a 4 million square-foot/$2.5 billion downtown Los Angeles sports, entertainment and residential district adjacent to Staples Center and the Los Angeles Convention Center. 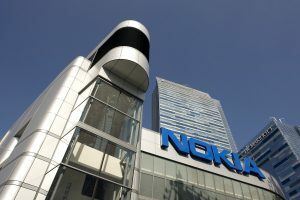 The Nokia Theater entertains over 500,000 people per year while hosting events such as live music concerts, cultural events, and industry award shows, including the American Music Awards, ESPYs, Primetime Emmy Awards, BET Awards and People’s Choice Awards. Shown in the background is the Ritz Carlton hotel and Marriott suites, additional CMF projects. 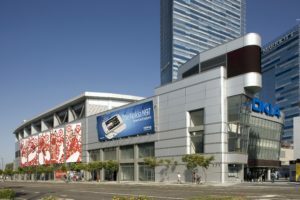 CMF installed over 65,000 square feet of Elward Systems RRDRY200 ACM panels on the theater. 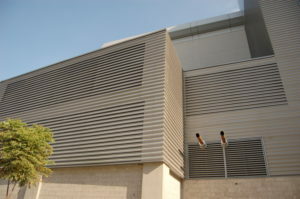 Exterior aluminum wall louvers were supplied by Construction Specialties. 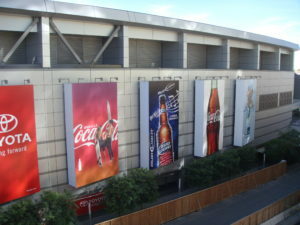 CMF also installed 21,000 square feet of 18-gage BR5-36 Centria profiled metal panel system.